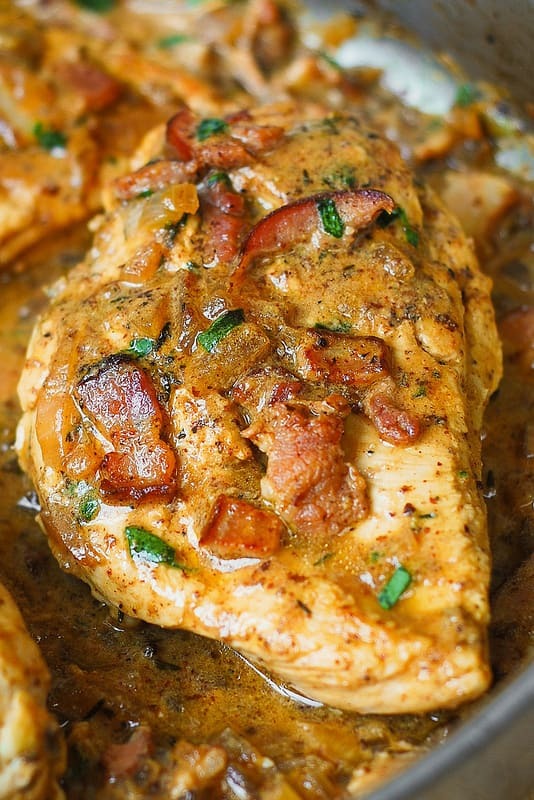 Chicken with Bacon and Mustard Sauce – an absolute comfort food! In this recipe, chicken breast is moist, tender, and flavorful because it’s smothered in the most delicious sauce ever! 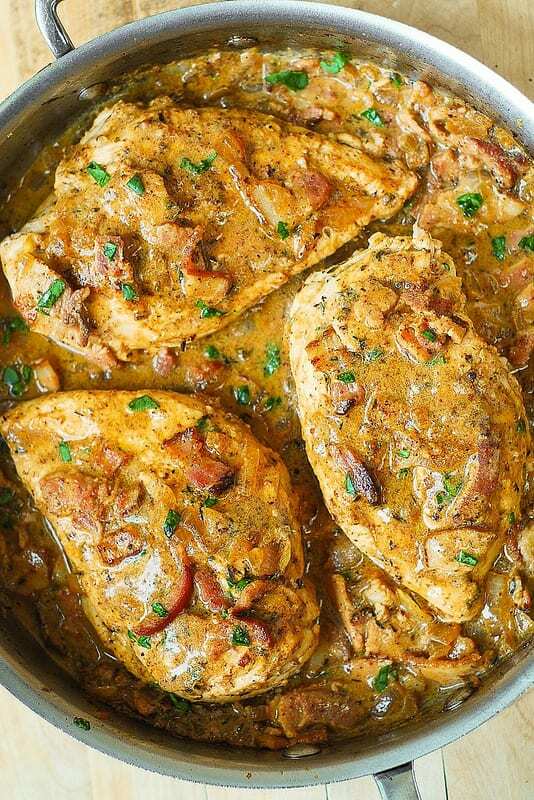 This bacon and mustard chicken is one of my most favorite ways to cook chicken breast. It’s easy and always a popular recipe with everybody who tries it! This whole dinner takes only 30 minutes to make! 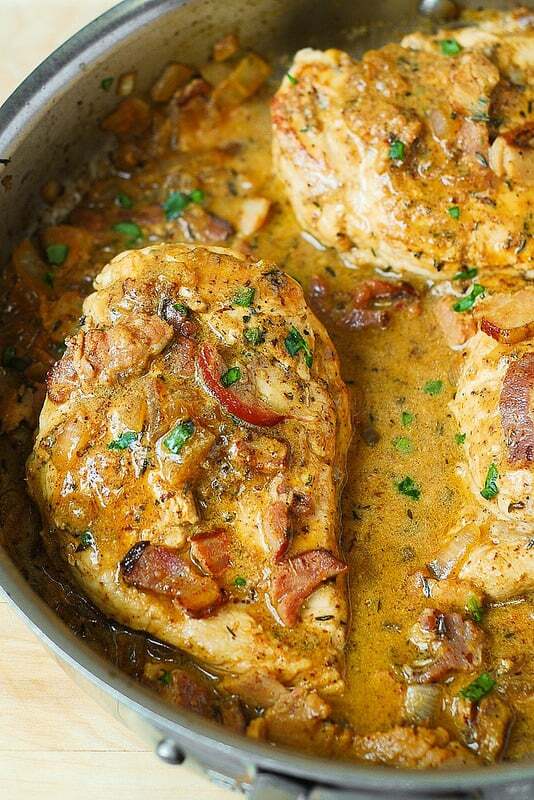 If you want a delicious creamy sauce for your chicken that has not cream, try this Bacon and Mustard Chicken. Moist, tender chicken coated with an amazing sauce! Combine Dijon mustard, paprika, salt and pepper in a small bowl, to make a paste. 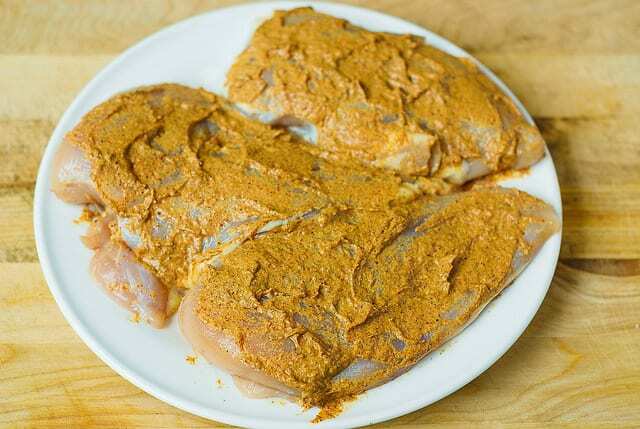 Spread the paste evenly on both sides of chicken breasts. Set aside. In a large skillet, cook chopped bacon on medium-high heat just until it starts to brown. 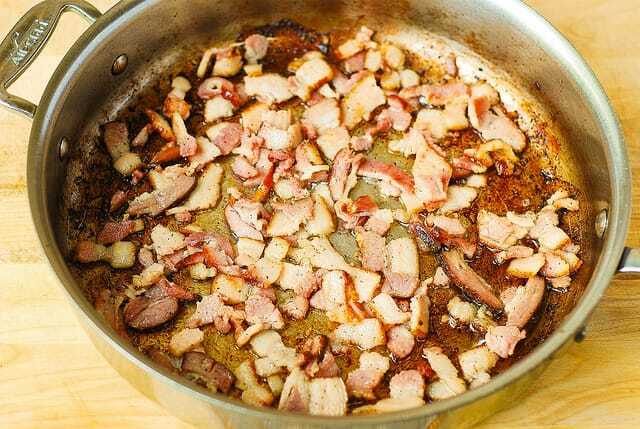 Remove to a plate, leaving bacon fat in a skillet. 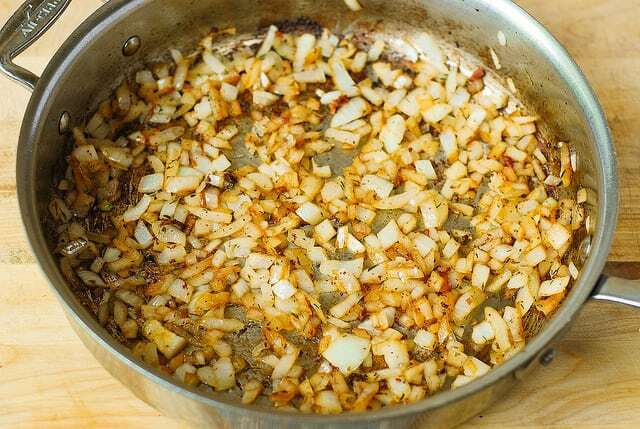 To the same skillet, add chopped onion and cook in bacon fat until softened. Remove to the same plate, with bacon. Add 1 tablespoon olive oil to the same, now empty, hot skillet. Cook chicken breast (with mustard paste on it), on medium heat, about 1.5 minutes on each side. The chicken will not be done as you will continue cooking it in the next step. Remove chicken to a plate. To the same skillet, add 1 and 1/2 cups chicken broth, bring to boil, scraping the bottom of the pan. Add back bacon and onions, mix well. 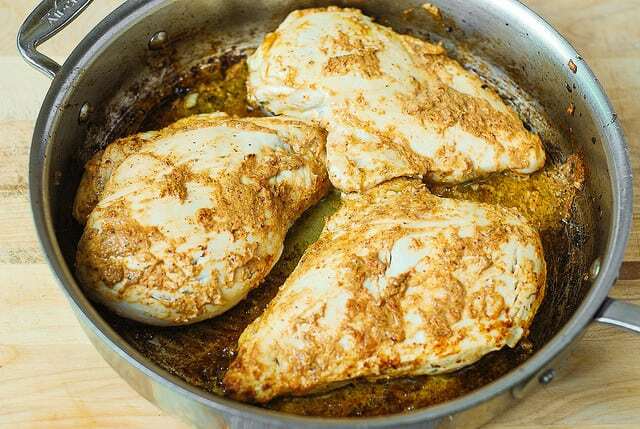 Add back the chicken breast, reduce the heat to low-medium and cook for about 15-20 minutes, turning chicken once, until chicken breast is fully cooked and no longer pink in the center. You’re very welcome! I am so glad you enjoyed this recipe! Great idea to slice the chicken so that every chicken bite is coated with the sauce. The addition of bell pepper sounds so good! Love this recipe. The taste is fabulous. I made 10 servings today and finishing them off in the crockpot. I used 4 cups of broth so I could cover the chicken. Now I have to go out and buy more containers for freezing. So glad you liked this recipe! 🙂 . Can this recipe be adapted for a crock or instant pot? Have not made this in a slow cooker or instant pot yet! Wonderful. Enjoyed by all. A keeper. Huge hit in my house… Even my picky eater. Great recipe!!! Hi, sounds great ! 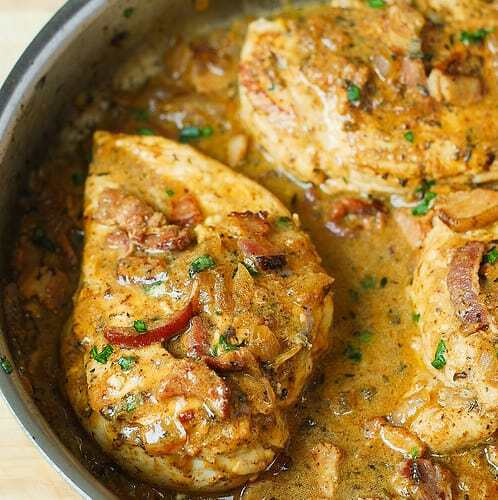 I am going to try this tonight using boneless skinless chicken thighs as that is al i have. Any idea on the nutritional info? 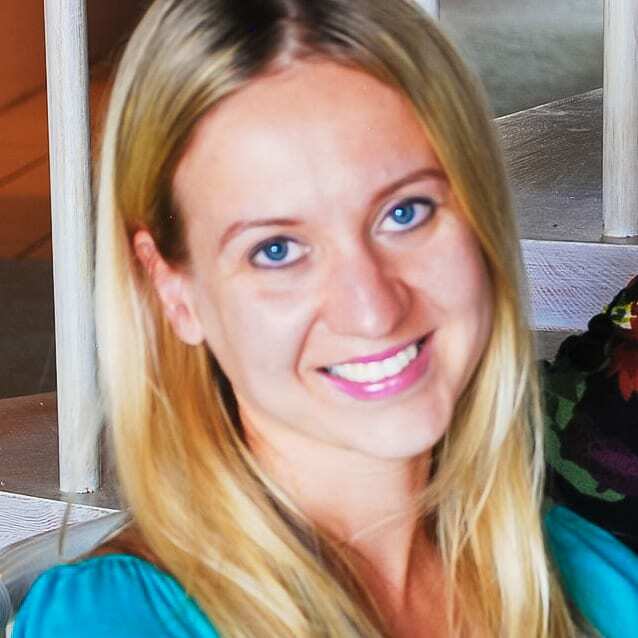 Im doing Keto and Im diabetic so nutrition is important. MaybeI missed it somewhere? I just updated this recipe with the nutritional info. This is absolutely delicious and really easy to make. I use a little more chicken broth so I have quite a bit of sauce. Also throw in several cloves of minced garlic and sliced mushrooms if I have them. So good with mashed potatoes. For my friends whose carb intake is limited, I make mashed cauliflower or steam broccoli. Cannot go wrong with this recipe. It works great made ahead and heated up. I always think I will eat the leftovers for lunch but they usually are gone by 10 am!! Thank you, Carol, for stopping by and leaving your wonderful comment! Like you, I love a lot of sauce with my chicken as well as lots of garlic. 🙂 Mashed potatoes are a perfect side dish with this chicken! What a great idea to serve mashed cauliflower instead of mashed potatoes. Yes, one can never go wrong with steamed broccoli as a side dish, either. Absolutely loved it, was easy to make too! The big test is if my son likes it but he usually does! Thank you! This looks nice, I’ve never cooked chicken with mustard before. I think I will try it soon. Enjoy! Chicken and mustard go really well together! Made this last night and it was DELISH! We all loved it. I added fresh chopped garlic with the onions. I will be making this again. Thanks for the recipe! You’re very welcome! So glad you liked it! Great idea to add freshly chopped garlic with the onions.